Wales' first minister should refer the conduct of one his ministers to an independent advisor, the leader of Plaid Cymru has said. Adam Price claims Lord Elis-Thomas is potentially in breach of the ministerial code on two counts. It relates to a row between the deputy culture minister and the National Library for Wales. Partially redacted emails revealed government officials discussed using funding for the National Broadcast Archive as leverage against the move. In a letter to First Minister Mark Drakeford, Mr Price said it was "unquestionably the case" that the minister and his officials did attempt to "intervene with the process of the appointment". The Plaid Cymru leader added: "Unquestionably, too, there was an attempt to intimidate the National Library with threats of interference with funding for the National Broadcast Archive." A Welsh Government spokesperson said: "We can confirm a letter was sent by the leader of Plaid Cymru to the first minister this morning. We will respond in due course." 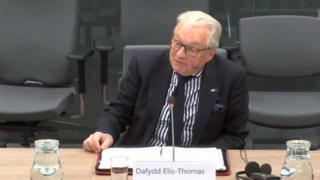 Lord Elis-Thomas is a former leader of Plaid Cymru who quit the party in 2016 to sit as an independent assembly member, pledging to support the Labour-led Welsh Government. The previous First Minister Carwyn Jones appointed him to the junior ministerial post the following year.